Foz do Cobrão – Uma Joia Escondida de Portugal. A short film about a historical village lost in the middle of Portugal. Foz do Cobrão is a village in the parish of Vila Velha de Ródão, district of Castelo Branco. It is located at the foothill of the Serra das Talhadas, on the left bank of the river Ocreza. It is one of the villages that make of the Network of the “Aldeias do Xisto” (Slate Stone Villages). On the left bank of the river, Ocreza flows the stream of Cobrão. It was there that the old settlement was born that later went up the hill, settling in a place of magnificent landscapes. The white paint of the houses gives an idea of ​the proximity to the Alto Alentejo. The quartzite crest of the Sarnadas mountain range frames the village and houses birds like griffins and black storks. The rocks of this mountain are about 500 million years old, imprinted on them are the ripples and fossils of an ocean that is no longer. This village is a combination of the natural landscape sculpted by an ancient Ocean and juxtaposition of a ​man maid agricultural landscape, essentially made of terraces planted with olive trees made with slate stone: till today the oil of this region is of very high quality. This is a land where ancient traditions still are re-lived. One of the most interesting is the gold mining on the banks of the Ocreza and ​Cobrão river. Feira dos Sabores do Tejo – 22 a 24 Junho 2018. 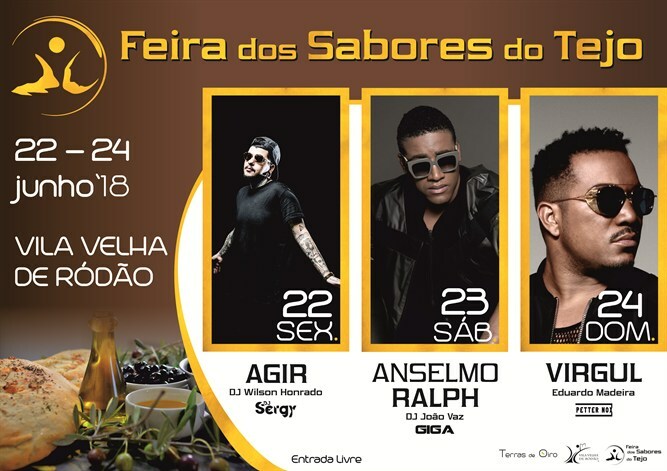 A Feira dos Sabores do Tejo que irá decorrer nos dias 22, 23 e 24 de junho, em Vila Velha de Ródão e contará com a presença de três grandes artistas do panorama nacional, AGIR, ANSELMO RALPH e VIRGUL são os cabeças de cartaz deste certame.